In a recent interview with TheJournal.ie, Director General of the CIF Tom Parlon dismissed claims from a new construction union called ‘Connect’ that it would eliminate the Scourge” of bogus self employment in the construction industry. There has indeed been a move away from direct employment in the construction sector. In 1998, the share of workers in the construction industry classified as self-employed was 16%. The Office of the Comptroller & Auditor General was, at that time, concerned that a significant portion of those classified as self employed were in fact bogus self-employed. Partly because of the C&AG’s concerns, the Revenue Commissioners undertook a special program of 6,200 visits to Principle Contractors in the construction industry. During the visits, the status of 63,000 sub-contract situations was examined. 12,000 (19%) of those sub-contract situations were not genuine self-employment, they were bogus self employment. In 2001, concerns were expressed at the Public Accounts Committee that misclassification was still rife in construction. The then Chairperson of the Public Accounts Committee, Jim Mitchell, ordered a similar special program of visits to Principle Contractors in the construction industry. The results of this PAC investigation exposed the same high level of bogus self employment in the construction industry – circa 20%. Over the following 6 years, the rate of self-employment in the construction sector fell almost 3% to 13% with a commensurate reduction in the percentage of Bogus Self Employed. The investigations instigated by the C&AG and the PAC were pivotal to that decrease. 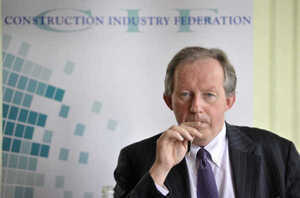 In July 2007, Tom Parlon took up a position as Director General of the Construction Industry Federation. Within five years, in an unprecedented explosion unseen anywhere else in Europe, the percentage of workers in sub-contract situations in the construction sector more than doubled before peaking at almost 31% (Refer to QNHS data below). Extrapolating from the only the widespread investigations available, instigated by the C&AG and the Public Accounts Committee, Bogus Self Employment in the construction sector was over 40% in 2013 and is currently running at almost a third (30% – 33%) of those classified as self employed in the construction sector. In 2015, the Irish Congress of Trade Unions released a report which states that Bogus Self Employment in the construction sector was costing the tax payer 80,000,000 euro in PRSI per year. This figure was based upon 30,000 – 40,000 sub-contract situations but later Dáil replies state that the actual number of sub-contract situations is in excess of 100,000, resulting in a loss to the taxpayer of circa 250,000,000 euro in PRSI per annum. As was confirmed by the Minister for Social Welfare in recent weeks on Drivetime RTE, there are no official figures available from either Social Welfare or Revenue on Bogus Self Employment, however, the QNHS data is generally accepted as credible, unlike the Pernicious Mr. Parlon. Posted in Misc and tagged Bogus Self Employment, Martin McMahon at 10:42 am on February 2, 2018 by Martin McMahon. That’s just one industry, bogus self employment is rife everywhere. Costs the taxpayer far more than recipient fraud. Bottom line, government agreed to turn a blind eye to PRSI fraud in order to reduce the numbers on the unemployment register. But I thought young people love precarious work and low hour contracts. It frees them up to eat avocado toast and sip socialist lattes. Bogus self-employment is rife in the contract engineering sector also across all disciplines – electrical, chemical, mechanical, civil, automation. Sickens me as a standard employee, to see our medium-sized company competing with “huge companies of several hundred employees” (on their proposals) who have less actual employees than us. These gangsters will leave all of these supposed “employees” go if the jobs don’t come in, but they’re happy to boast about them when tendering for work. And our PRSI payments will be going towards paying for these poor buggers when they’re laid off. I have no inside knowledge about what goes on in the industry. But this claim “Within five years, in an unprecedented explosion unseen anywhere else in Europe, the percentage of workers in sub-contract situations in the construction sector more than doubled before peaking at almost 31% (Refer to QNHS data below).” needs examination. The problem was that between Q2 2007 and Q2 2012 construction employment as a whole FELL BY TWO THIRDS from 241k to 82k! So it is indeed a higher proportion but of a MUCH SMALLER number. Furthermore, people who are laid off convert from ’employment’ to ‘unemployment’ for statistical purposes. A solo plumber who goes from doing ten jobs a week to one job a week is still described as ‘self-employed’ for statistical purposes even if her income is barely enough to eat. So this “unprecedented explosion” is just a statistical artifact. It is not supporting evidence of a growth in bogus self-employment (which may or may not exist on a large scale, I really don’t know). 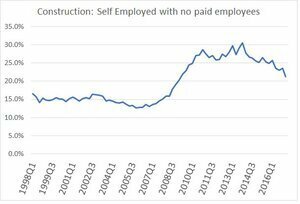 there is no denying that there was an explosion in the percentage of construction workers classified as self-employed, it is self evident from the available data. It cannot be dismissed as a statistical artifact. That the level has remained high indicates that it is not a statistical anomaly. Ur point about employed/unemployed is complete irrelevant. Ur point about a plummer, again completely irrelevant. If you have data to disprove the above data, present it. Otherwise you’re blowing smoke. Imagine a small island in the Pacific Ocean. It has ten men and ten women on it. 50% male and 50% female. Imagine a famine comes along and kills eight men and two women. Now you have a population which is 20% male and 80% female. Is this an ‘explosion’ in the share of humans on the island which is female? Bogus Self Employment in the construction sector was over 40% in 2013 and is currently running at almost a third (30% – 33%) of those classified as self employed in the construction sector. It was down percentage wise since 2013, but increased in actual numbers. You’d want to do another imaginary scenario there. There is no source cited for this claim. 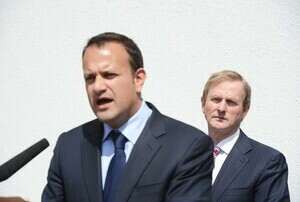 Extrapolating from the only the widespread investigations available, instigated by the C&AG and the Public Accounts Committee, Bogus Self Employment in the construction sector was over 40% in 2013 and is currently running at almost a third(30% – 33%) of those classified as self employed in the construction sector. Hope Harvard Style is ok for you. It’s an extrapolation based on a report from nearly 20 years ago. It’s like claiming that 65% of Irish people prefer eircell to Esat. No it’s not. Read it again. this is really quite tiresome, let me make it simple for you: ur example is predicated on the falsehood that self employed persons were immune from shrinkage in percentage. This fallacy is exposed by CSO stats which show that 1 in every 3.5 jobs created from 09 – 14 were classified as self-employed (across all sectors). As I said previously, present ur data or go away. Talking about a rise between 2009 and 2014 is meaningless as there was a big trough in the middle. It shows you don’t know what you are talking about. Have a good weekend. To make ur presumption accurate, self-employed with no employees would have to be a more secure form of work than direct employment. Statistically and economically we know the opposite to be true. One would expect the reduction in self employed percentage to reduce even faster than the percentage reduction in the employee numbers. But you run on home now, don’t let facts get in your way. A self-employed worker who suffers a 90% decline in demand for their work is still classified as self-employed by the CSO. They are simply classifying humans by their employment status, not how many hours they are working once they are greater than zero. This is true on the way up as well as down. Employment tends to be binary in nature. You are either an employee or you aren’t. Unemployed people don’t identify as self employed. Please, ur embarrassing urself. In 2017 there were 75,000 construction workers registered as self-employed (out of a total workforce of circa 130,000). 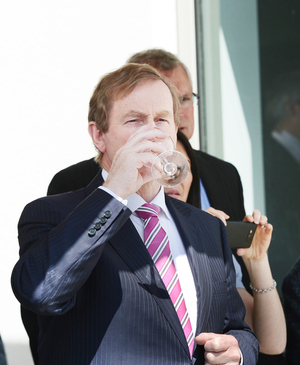 The source for these figures comes from a PQ raised to Michael McGrath, Fianna Fail T.D.. Between the years of 2008 and 2014 there was a combined total of 500,000 construction workers registered as self-employed. The total tax take in those years was minus 90million! This information arose from a parliamentary question raised with Peadar Tobin, Sinn Fein T.D.. 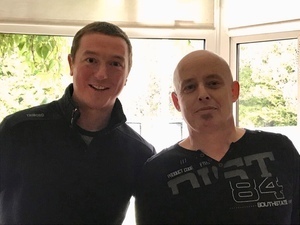 In November 2017, Philip Boucher Hayes stated on RTE’s Drive Time programme that Ireland was the only country in Europe where an employer could register any employee as self-employed. When Government Ministers were questioned on this matter they stated that any employee with concerns should raise them with the Revenue Commissioners. From personal experience I have discovered that this process can take 3 years from start to finish! Anyone who believes there is no bogus self-employment or that the figures are exaggerated is delusional. Anyone who believes that there is anyone in government who is willing to resolve the matter is also delusional.